I am searching for a stuffed animal made by Gymboree in 2000. I believe it is called “Bedtime Bear.” I received it as a gift at my baby shower in April, 2000. My daughter took to it at 5 months old and loves him to this day! The “Blue Bear” that she loves today is actually a replacement I found on eBay in 2003, as her original “Blue Bear” was LOVED to shreds!! This one is now in worse shape than the first, and I would do anything to give her another replacement. If anyone can help, I would be most appreciative. 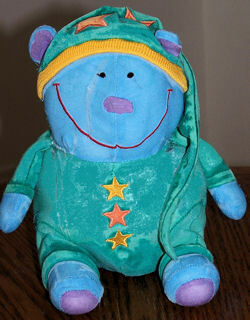 If you can help Christy find this 2000 Gymboree Blue Bedtime Bear, THIS SITE IS NO LONGER ACTIVELY MANAGED. Please use Our FREE FACEBOOK GROUP, including #100908-6 in the subject, . Wow, what a lovely “Bedtime Bear”! Even a glimpse was enough to heal my heart – thus your site comforted and empowered me to stay awaken and look with trust to the future. Unfortunately, I can’t help Christy anyhow, but I was comforted greatly indeed. What a nice surprise, Tomas!!! I have been so busy with this Search Service and our own business that I had to all but quit visiting blogs. I’ll have to stop by and see what you have been up to. I hope all is well with you, and I’m so glad you took the time to write!!!! Oh my gosh! I have been searching for this same bear since ’04. My son, born in 2000, hasn’t slept a night without his Bedtime Bear. It is so ragged and has had several “surgeries.” Has anyone found it?! Niki I will email you when one is found. I list one on eBay# 160310315505 if anybody still interested. Thanks, Brieanna. I let them both know about it. Hi all! Yep…like the other moms frantically searching for Bedtime Bear for their kids…I find myself on the same mission. I know this thread is pretty old but please if anyone ever checks it anymore AND knows where I can buy another Bedtime Bear please please PLEASE let me know! My 11-yr-old son would be amazed to see what the bear looked like originally before he literally started loving the fur off of his at age 6 months!